Seek advice about any mole that changes colour or size. 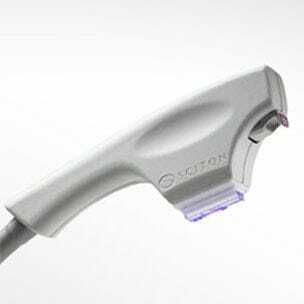 The Sciton BBL BroadBand Light Laser is used to minimise the scars from surgery and enhance new collagen formation. 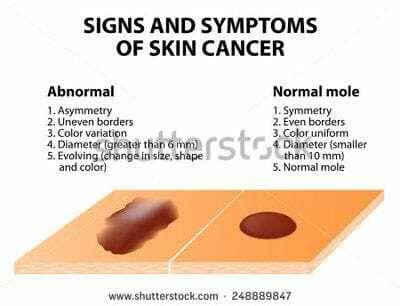 Skin cancer can be broadly divided into two types: The first is non-melanoma skin cancers, of which the most common examples are basal cell cancer and squamous cell cancer. Two out of three Australians will get at least one in their lifetime. They usually form on the head, face, neck, hands and arms. 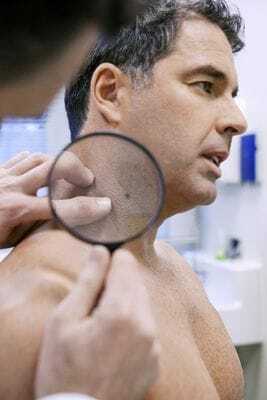 Pre-cancerous forms of non melanoma skin cancer, or sun cancers, are known as sunspots or actinic keratosis. One in ten of these has the potential to convert into a skin cancer. The other group, melanoma is more dangerous but less common. These are the moles that change and grow and can spread through the body. With early diagnosis these are curable. Hence the importance of early detection. Therefore, any new or changing spot always needs to be reviewed by your Dermatologist. Treatment is more likely to work well when cancer is found early. If not treated, some types of skin cancer cells can spread to other tissues and organs. Therefore, it is important you have your skin checked by a specialist dermatologist who has the skills and training for early detection and management. A common reason why skin lesions are excised, is to fully remove skin cancers such as basal cell carcinoma, squamous cell carcinoma or melanoma. It is impossible to cut the skin without scarring in some way, so you will always have some sort of scar. At Darlinghurst Dermatology Skin & Laser Clinic we will try to excise the lesion in a way that will keep the scar to a minimum. Some people have an abnormal response to skin healing and these people may get larger scars than usual (keloid or hypertrophic scarring). Special post operative care can help minimize this occurring. What is involved in excision of a skin cancer lesion? Your dermatologist will explain to you why the skin lesion needs excision and the procedure involved. You may have to sign a consent form to indicate that you consent to the surgical procedure. Tell your doctor if you are taking any medication (particularly aspirin or warfarin, which could make you bleed more), or if you have any allergies or medical conditions. Remember to tell your doctor about any herbal remedies, as a number of these can also lead to abnormal bleeding. The most common type of excision is an elliptical excision. The ellipse is designed so that the resulting scar runs parallel with existing skin creases. This ensures that the scar is as narrow and short as possible and blends with the natural skin folds and wrinkles. The area to be excised is marked with a coloured pen. The dermatologist will then cut around and under the lesion with a scalpel and sharp scissors so that it is completely removed. The lesion is placed in formalin ready to go to the pathology laboratory. Here, a pathologist will examine the specimen and provide your doctor with a report a few days later. There may be some bleeding in the area from where the lesion has been removed. The doctor may coagulate the blood vessels with a diathermy. This can make a hissing sound and a burning smell. The edges of the ellipse will then be sewn together to make a thin suture line. This type of wound closure is called primary closure. There may be two layers of sutures (stitches) a layer underneath that is absorbable and a layer of sutures on the surface which will need to be removed in 7-14 days. A dressing may be applied and instructions will be given on how to care for your wound and when to get the stitches out. The scar will initially be red and raised but usually reduces in colour and size over several months. At Darlinghurst Dermatology Skin & Laser Clinic we also offer laser treatments to the scar with the profractional erbium laser to minimize the scar's appearance at 4 weeks after the surgery. The laser enhances new collagen formation during the scar remodelling process leading to finer and less visible scars. This option is performed under local anaesthetic. An instrument is used to scrape the tumour out of the skin in combination with cautery. Fresh new skin then grows over the top. It is used for less aggressive skin cancers. Topical 5-Fluorouracil 5% cream is often abbreviated to 5-FU. The trade name is Efudix. 5-Fluorouracil is most often prescribed for solar keratoses (red scaly spots that are precancerous and related to sun exposure) Bowen's disease (early form of skin cancer). It destroys sun-damaged skin cells so the skin appears smoother and more youthful. It has the capacity to selectively tell the difference between normal healthy skin cells and those that have abnormal sun damaged DNA. Therefore, it only treats the bad skin leaving the good skin cells alone. It works best on face and scalp, and is less effective on other areas. 5-Fluorouracil is a powerful, destructive medication and must be used exactly as directed. It is usually used for 2-4 weeks depending on the area being treated and the type of lesions. The 5-FU cream is applied once or twice a day after washing the area that is to be treated. The frequency will be determined on an individual basis after assessment. Imiquimod is an immune response modifier. It is manufactured as a 5% cream called Aldara. Imiquimod is mainly used to treat genital warts, solar keratoses and basal cell skin cancers. For biopsy proven superficial BCCs, the PBS funds the majority of the cost of the prescription. Imiquimod works by stimulating the immune system to release a number of chemicals called cytokines, which are important in fighting viruses and destroying cancer cells. When used to treat skin cancers and pre-cancerous lesions it results in inflammation, which destroys the lesion. Imiquimod is particularly useful on areas where surgery or other treatments may be difficult, complicated or otherwise undesirable, especially the face and lower legs. A course of treatment ranges from 4 to 16 weeks. Before starting, a biopsy may be performed to confirm the diagnosis. Your doctor should carefully monitor the treatment because you may need to apply the cream more or less frequently than originally planned or for a shorter or longer course, depending on response. Once the inflammation has settled there is generally a good or excellent cosmetic result with little scarring. Solar keratoses (also called actinic keratoses or SKs). Solar keratoses 3 x weekly for six weeks, repeated if necessary after a break of four weeks. Basal cell carcinomas and Bowen's disease Five times weekly for six weeks.